During the interwar years in Japan, discourse on culture turned sharply inward after generations of openness to Western ideas. The characterizations that arose—that Japanese culture is unique, essential, and enduring—came to be accepted both inside and outside Japan. Leslie Pincus focuses on the work of Kuki Shuzo, a philosopher and the author of the classic "Iki" no Kozo, to explore culture and theory in Japan during the interwar years. She shows how Japanese intellectual culture ultimately became complicit, even instrumental, in an increasingly repressive and militaristic regime that ultimately brought the world to war. Pincus provides an extensive critical study of Kuki's intellectual lineage and shows how it intersects with a number of central figures in both European and Japanese philosophy. The discussion moves between Germany, France, and Japan, providing a guide to the development of culture in a number of national settings from the turn of the century to the 1930s. Inspired by the work of Foucault, the Marxist culturalists, and the Frankfurt School, Pincus reads against the grain of traditional interpretation. Her theoretically informed approach situates culture in a historical perspective and charts the ideological dimensions of cultural aesthetics in Japan. 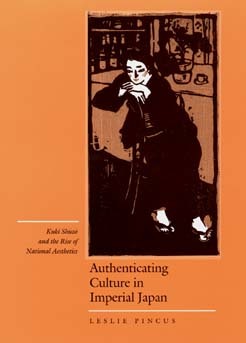 Authenticating Culture in Imperial Japan makes an important contribution to our understanding of modernity, nationalism, and fascism in the early twentieth century. Leslie Pincus is Associate Professor of History at the University of Michigan.